Deep in the heart of the forest, Belgium provides one of the most remote but legendary circuits on the F1 calendar. 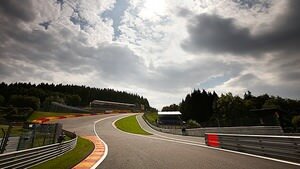 The fearsome Eau Rouge corner ranks highly in any list of top turns, an uphill twisting section with a blind crest. At just over 7km, the track is one of the longest, but is still a cutdown version of the full Spa track. As with many European races, the weather can provide an additional challenge, particularly as one end of the track can be dry as clouds break over the other.